Need something a little different? 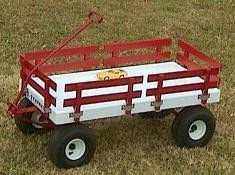 In addition to Amish-made wooden wagons, Durable Toys also carries a variety of plastic wagons. These wagons are built with the same painstaking care as the wooden wagons, and have the added bonus of being virtually weather-proof. 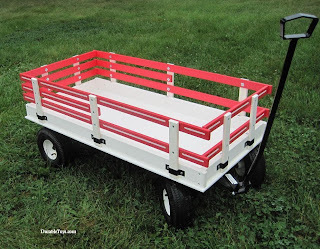 Hochstetler has several models, and even makes a wagon model out of recycled plastic. The colors are bright and attractive, and you can purchase wooden or plastic racks depending on the brand. 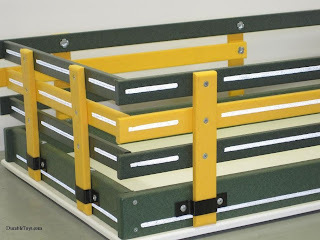 The Hochstetler plastic racks come in blue, red, and green and yellow, all with white striping. 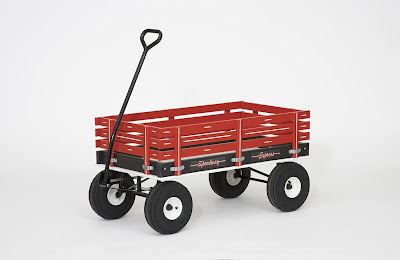 Speedway Express carries three plastic wagon models, all of which come with standard wooden racks. These come in the standard colors, including green and yellow and pink. This wagon comes with a red welded steel undercarriage to support heavy loads.